Roof cleaning/Roof moss removal & Render Cleaning service covering Solihull, Bromsgrove,Birmingham and surrounding areas of West Midlands. Cleaning your roof/render/k-rend frequently, helps maintain the overall neatness of your property, whether commercial or residential. It increases your property’s value and enables you to make an excellent first impression on your guests and customers. When neglected, the roof accumulates roof-damaging materials like debris, fungus, mould, black algae, mildew and all types of moss. These materials damage all forms of roofs including metal roofs, cedar roof surfaces, composite asphalt concrete tile roofs, shingle roofs amongst others. As a full-service roof cleaning/Roof moss removal/render cleaning & K-rend cleaning company in Birmingham, West Midlands, we specialise in all forms of roof/render/K-rend cleaning including removal of mould, organic matter, loose debris, mildew, moss algae, low-pressure roof/render/K-rend cleaning etc. With our 16 years of practice in the industry, we not only remove and clean the moss from your roof/render/K-rend, but go the extra mile to prevent any further growth. Our ability to provide same day service and 24/7 emergency cleaning services has helped us stand out from the competition as a professional roof washing/ Roof moss removal & render cleaning company in Birmingham, West Midlands. We tailor our gutter cleaning, roof cleaning, and render/K-rend cleaning to your needs and we value all jobs as no project is too big or too small to be executed. We’re a family owned and run company with over 16 years of experience and understand the importance of using eco-friendly products in our work. We provide environment safe and professional roof cleaning & render cleaning methods, and we use the latest high tech equipment to provide the best services. 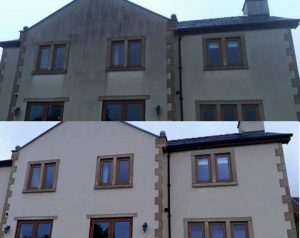 Our passion and growth mindedness have helped us tackle even the most challenging exterior cleaning situations in numerous country homes and commercial properties. Our services are competitively affordable, and you’re charged according to your unique cleaning needs. We’re always available to provide you with high standard roof cleaning/Render cleaning /K-rend cleaning services, and we offer a free no obligation estimate on all your cleaning needs. We offer a High Pressure Cleaning and softwash option. With the softwash, we first remove all existing moss. We then apply a two coat application process.